Cody Willoughby | AIM Media Midwest First graders Shane Pearson and Reed McGraw chow down during the school-wide Thanksgiving feast on Tuesday at Washington Primary School in Piqua. All students grades K-3 were provided meals and desserts by Unity National Bank and Miami Valley Steel, who offered volunteers to serve meals on site. Cody Willoughby | AIM Media Midwest From left, kindergartners Hayden Jury, Carli Epperson, Aurora Helman, and Hayden Webb enjoy meals provided in the school-wide Thanksgiving feast on Tuesday at Washington Primary School in Piqua. All students grades K-3 were provided meals and desserts by Unity National Bank and Miami Valley Steel, who offered volunteers to serve meals on site. First graders Shane Pearson and Reed McGraw chow down during the school-wide Thanksgiving feast on Tuesday at Washington Primary School in Piqua. All students grades K-3 were provided meals and desserts by Unity National Bank and Miami Valley Steel, who offered volunteers to serve meals on site. 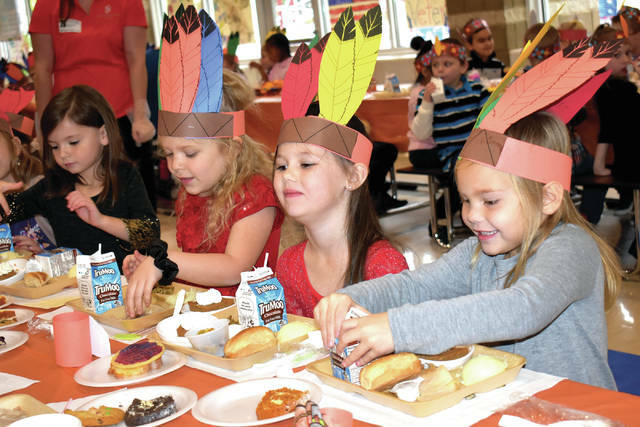 From left, kindergartners Hayden Jury, Carli Epperson, Aurora Helman, and Hayden Webb enjoy meals provided in the school-wide Thanksgiving feast on Tuesday at Washington Primary School in Piqua. All students grades K-3 were provided meals and desserts by Unity National Bank and Miami Valley Steel, who offered volunteers to serve meals on site. 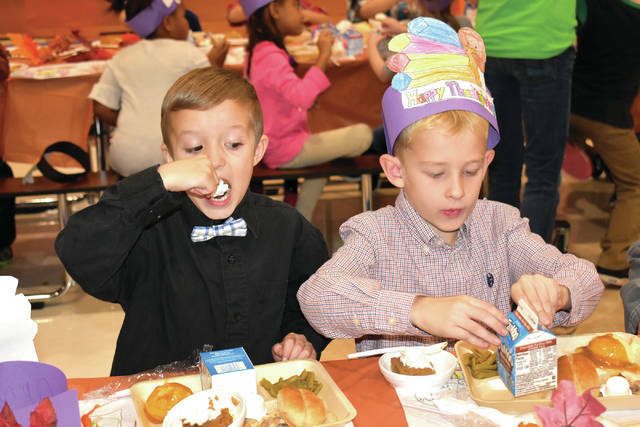 https://www.dailycall.com/wp-content/uploads/sites/30/2018/11/web1_WashingtonFeast2.jpgCody Willoughby | AIM Media Midwest First graders Shane Pearson and Reed McGraw chow down during the school-wide Thanksgiving feast on Tuesday at Washington Primary School in Piqua. All students grades K-3 were provided meals and desserts by Unity National Bank and Miami Valley Steel, who offered volunteers to serve meals on site. https://www.dailycall.com/wp-content/uploads/sites/30/2018/11/web1_WashingtonFeast1.jpgCody Willoughby | AIM Media Midwest From left, kindergartners Hayden Jury, Carli Epperson, Aurora Helman, and Hayden Webb enjoy meals provided in the school-wide Thanksgiving feast on Tuesday at Washington Primary School in Piqua. All students grades K-3 were provided meals and desserts by Unity National Bank and Miami Valley Steel, who offered volunteers to serve meals on site.